My Glossybox for March has arrived! For those of you are unaware of what Glossybox is, they are a company that sends you five moderate to full samples of different beauty products for only $15 a month. 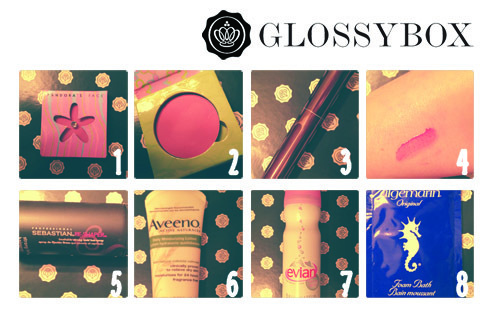 For more information definitely follow them on twitter: @glossy_ca or visit their website: glossybox . 1 & 2: PANDORA'S FACE BLUSH: This blush in the colour St. Tropez. It is a faint fuchsia that isn't too pigmented but adds a really nice flush colour to the face. The blush retails in stores for about $18 and is definitely a nice colour to take into spring. For more info about Pandora Makeup follow them on twitter: @PandorasMakeup. 3&4: BAILEY LIP GLOSS: This lip gloss is in the colour Berry and judging from the colour of the gloss in the tube seems very dark, however once it is swatched on the lips or hand as shown above it is a really light plum colour that can be built up if needed. What I really loved about this gloss is it wasn't sticky and it didn't dry out my lips which is my main problem with other glosses. The gloss retails in stores for $28. 5: SEBASTIAN RE-SHAPER HAIRSPRAY: This is a strong hold hairspray, that from what I can tell does it's job. I am not too picky when it comes to hairspray so I do not have too strong of an opinion. I do however like that it is a convenient size for travelling. The hairspray retails in stores for $19.95. 6: AVEENO LOTION: I have always been a strong fan of Aveeno products because I find they work. Canada's weather is very unpredictable which can result in very confused skin. I always carry an Aveeno hand lotion with me and it always does it's job. The lotion retails in stores for $11.99. 7: EVIAN FACIAL SPRAY: I have always been curious about this product and I have spotted it many of times in Sephora and now I finally had the chance to try it out and it's wonderful. Within a few seconds of spraying it on your face you feel refreshed and hydrated. I definitely look forward to using this product in the morning to brighten up my face. The spray retails in stores for $7. 8: ALGEMARIN FOAM BATH: This was a little bonus gift from Glossybox and I haven't had a chance to try it out yet but I am looking forward to it. It's a bath foam that is made from extracts of seaweed, algae and mineral salts. This will be nice to sit back and relax after a very stressful week. The foam retails in stores for $23.95 for 750 ml. Glossybox is a wonderful subscription and I definitely recommend it to anyone who likes to try new products but doesn't want to commit to paying full price. You definitely get more than your money's worth which is always an added bonus! If you'd like to ask me anymore questions about the products listed above, or anything in general please feel free to comment below or tweet me @lbdgirls. maybe you'll have a look on my blog as well. thanks for your sweet comment Rebekah! It's too bad they don't put nice products in them, it's a really nice program here and in the UK. We will definitely take a look at your blog.